Morning Star Patchouli Japanese Incense - powerful and evocative. Patchouli is a species of herb from the mint family known scientifically as Pogostemon cablin, a native of tropical Asia. A strong fragrance that is more woody than herbal. It has been valued since ancient times; with the Egyptian pharaoh Tutankhamun being laid to rest with approx. 40 litres of patchouli oil – as discovered upon his tomb opening by Howard Carter in November 1922. 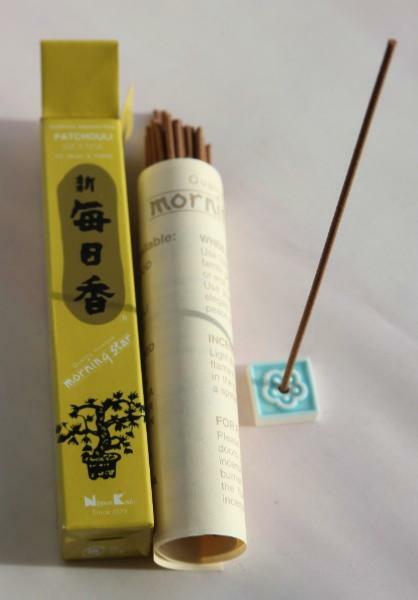 Morning Star Patchouli incense is also available in a box of 200 sticks. A bit strong for me - but if you like patchouli you should be happy! Morning Star are a great value and quality brand. Not a big thing but expected scent to last longer. Very nice aromavand burn time. John falk ,bought for grandaughter. Exactly as expected wonderful fragrance an no nasty black smoke. Great service product arrived quickly and in good condition will definitely be ordering a lot more in various fragrances. Perfect for meditation burning time is about 30mins. Thank you.